There is a proliferation of English Indian fiction especially from the young Indian authors in the last few years. Most of these revolve around themes such as romance, relationship strains, emotional recoveries and marital adventures of urban, middle class, educated and career youth. Much of the story line and instances narrated are repetitive in many works and the ends are predictable. Another ‘popular’ stream of non-fiction originated in the last several years is from the authors who are fascinated by the Indian mythologies. It was a very refreshing feeling when I came across ‘Paradise Lost & Regained’ by Ratnadip Acharya, an acclaimed author who wrote several pieces for ‘Chicken Soup for the Soul’ series. Charles Darwin wrote ‘The Expression of the Emotions in Man and Animals’ in 1872 to tell the world about the life and relationship within the animal world. He wrote about the verbal and non-verbal communication of emotions by animals. Very few authors attempted to travel to the animal world to create imaginative work of fiction. Works like ‘Animal Farm’ by George Orwell, ‘Watership Down’ by Richard Adams, and ‘Warriors into the Wild’ by Erin Hunter are very popular even today. While travelling in a train from Kanyakumari, the southern tip of India towards Thiruvanathapuram, I enjoyed the beautiful sight of several cows and goats happily grazing in the wonderful greenery in a moderately pristine surrounding. Some of them looked at the train and the passengers, though that would be a very familiar sight for them every day. Birds sat on on the cows and picked what they want and the latter enjoyed it. There were calves playing around the field with joy. Dogs and goats slept adjacently. Watching all those beautiful moments designed by the creator for all beings without any discrimination was quite a fulfilling experience. Some beings in the world choose to be happy through peaceful coexistence and some others, like we the humans, fight for an upper hand. I would not have keenly observed those beautiful creations on that journey but for the book I was reading at that time. ‘Paradise Lost & Regained’ kindled an urge within me to observe, understand and learn from the animal world. Certainly, I too got the revelation like the young deer (the protagonist) in the book that all life on earth is a gift from nature which comes in a package that contains challenges and danger and one must be courageous and responsible enough to make the most of life, and to share it with others. 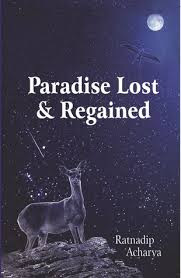 Paradise Lost & Regained is a beautiful story as told by a deer about not only the physical environment we live but also about the universal attributes of trust, love, hope and courage. The deer vividly narrates about her life from the birth in the forest to human captivity, and the great escape. The events narrated are very entertaining, intriguing and exciting. It is very evident that the author is a keen observer and has a clear understanding of animal instincts, behaviors and responses. The book triggered in me several strands of thoughts that I would like to share. As we live in this world and cross various stages in life, we face many people, challenges and opportunities. In the early life, when there are many things to explore and get excited, we find meanings but tend not to probe and evaluate. But later in life, we get into an ‘evaluation’ mode rather than a ‘living’ mode. If the evaluation is on us it is productive and reformatory. But if the target of evaluation is always the other people and events – past and present, then it is derogatory, wasteful and destructive. Thus we ‘live’ each moment in the childhood and as we grow up as an adult, we tend to spend most of our time worrying and regretting. We tend to forget that the life is a precious gift and that we need to live in gratitude the entire life. In the story of the deer we see that the biggest compliment one can get is from one’s own mother as none loves us so much than our mothers. None instills in us more confidence than our own mothers. “You are one of the chosen few, my child. I am so proud of you”, whispered the mother to the baby deer who had already read her mother’s message for her in her eyes, radiant with joy. The mother’s words, her tender care and the protection gave the baby deer the courage to face the challenges in life and to succeed. How many times in our life as we grow big and cross many landmarks, we think about the pain of the mother and the influence she had made on our personality. The little deer was grateful: ‘Feeling grateful to life, I closed my eyes while the milk from my mother’s breast continued discharging into my mouth without the least effort of mine. I wished this rare moment had never come to an end’. The mother gives the first lesson of unconditional love in our life. She is love personified. This is a story of emancipation by carving out paths ourselves against all odds. The author makes the protagonist think like one in the ‘Alchemist’ by Paulo Coelho that ‘if the universe has conspired to set me free from here, no man-made barrier can thwart me in getting my golden days back….a strong trust filled my heart and made my eyes twinkle with joy’. It is a humbling but enlightening exercise if we, humans, attempt to observe our fellow beings from the animal kingdom. That can indeed create a social-psychological awareness of the whole system of creation and the purpose of life. From that learning, we could gain a new perspective about the mother earth and how we should treat our fellow beings. Read some of my other book reviews below.